I've been reading Joy the Baker's website for a few months, and she has some great-looking recipes. I made her low-fat oatmeal muffins once, and when I saw this recipe for cinnamon bun muffins, I immediately wanted to try them. But, well, if you came here looking for me to crash and burn once again...you're in the right place. This recipe is basically a cinnamon bun - yeast included - with a little less waiting and dough working. And baked in muffin tins. Sounds good so far, no? I rarely work with yeast, since what little experience I have with it, has proven that yeast dough products deteriorate quickly. While they're good the first day, by the second day the drop off is significantly noticeable. 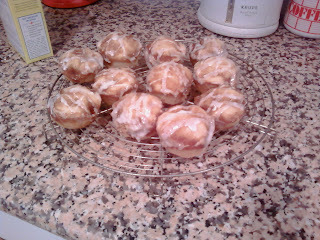 Anyway, I didn't let that stop me, and I set out to create these muffins. I was a little concerned working with the yeast, and mixing it with warm milk to "activate it." Since I really haven't worked with it much, I had no idea if it was doing the right thing, but I went ahead anyway. Here's the dough, waiting patiently to expand. At this point, you're probably assuming that something with the yeast went horribly wrong, and they either blew up to three time their size or sat in the muffin tin as hard little balls - but that simply isn't the case. Instead it was the streusel, the innocent little mixture of butter, brown sugar and cinnamon, that turned my muffins into disasters. 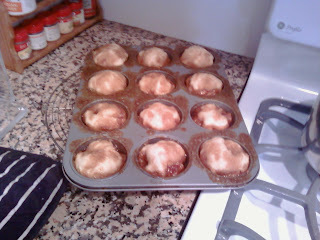 But, when I snuck a peak about halfway through the baking process the mixture had melted and spread all over the muffin tin, and was barely inside them at all. 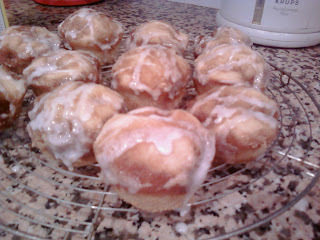 Not easily discouraged, I let them finish anyway, and when they were cool I mixed up the icing and drizzled it on top. Since the tin was already such a mess I figured I might as well ice them in there anyway. And yes, I ate one first. Of course we ate every muffin, and they weren't bad, but something definitely went wrong. The next day, they were a lot drier, but after a quick zap in the microwave, they are certainly improved. Moral of the story? Who knows. Sometimes with my disasters, it is clear what went wrong, but there are also times like these, where I'm just not sure what I didn't do. One thing is for sure - in my house - even the mistakes get eaten. Tip of the Day: Your yeast is working if it starts to bubble in the warm water after a couple minutes. Be patient! Combine flour, sugar and salt in a bowl. Combine yeast and warm milk, in a cup. 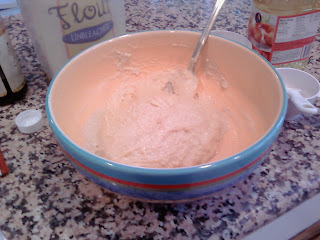 Pour the milk, oil, vanilla and egg into the flour mixture and stir until smooth. 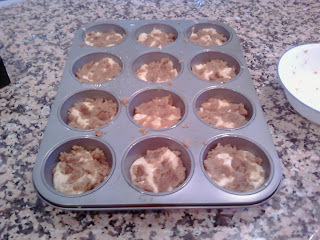 Divide batter into 12 greased cupcake tins. 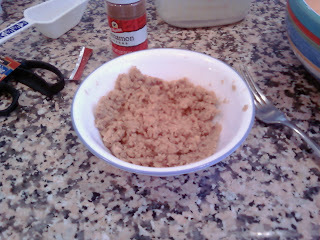 Mix together the butter, brown sugar, cinnamon and cardamom in a small bowl. Sprinkle over the muffin tins and press down in to the dough. Place the pan in a cold oven, turn it to 350F, and bake for twenty minutes. Remove from the oven and let cool before topping with the icing. 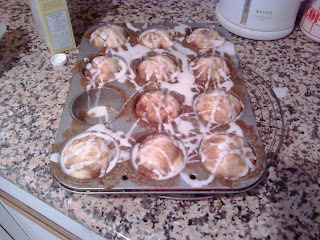 It was a good try - and the muffins still look good to me! Hi! I'm new in blogging! 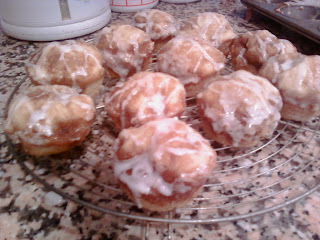 I don't know what happened to your muffin-buns, but still, they look great!